Saxophonist, flutist, and composer Laura Dreyer is a vibrant, creative voice in the New York jazz scene. Her catchy original compositions combine lyrical melodies with jazz, Brazilian rhythms, funk, and rock, resulting in an exciting, contemporary palette of sound with a strong rhythmic twist. A multi-instrumentalist,audiences have heard her in the bands of such diverse artists as Dr. Billy Taylor, Dom Salvador, Helcio Milito, Portinho, Bossa PDX, Walter Bishop Jr., Mel Lewis, Robert Palmer, Nnenna Freelon, saxophonist/author James McBride, “The Diva Jazz Orchestra, and many others. 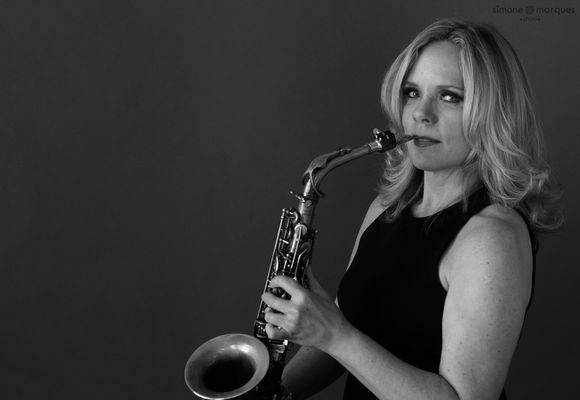 Laura has recorded four CDs as a leader/producer, including Mysterious Encounter (Lavasphere), Free Flying Bird (Sony/Piloo), and Sax in the City (Apria), and Vida. Arte. Amor. (Mayimba Jazz). She is also featured on acclaimed Brazilian pianist Dom Salvador’s newest release, The Art of Samba Jazz, which received a Premio da Musica Brasileira award for Best Instrumental CD. Laura attended The Berklee College of Music and has a Bachelor of Arts degree from SUNY Empire State College. Additionally, she has studied with saxophonists Joe Henderson and Joe Lovano, pianist Dennis Kaufman, and composers Lyle Mays and Jim McNeely.